TC's latest processor makes it easier than ever before to manipulate the sound of your voice. 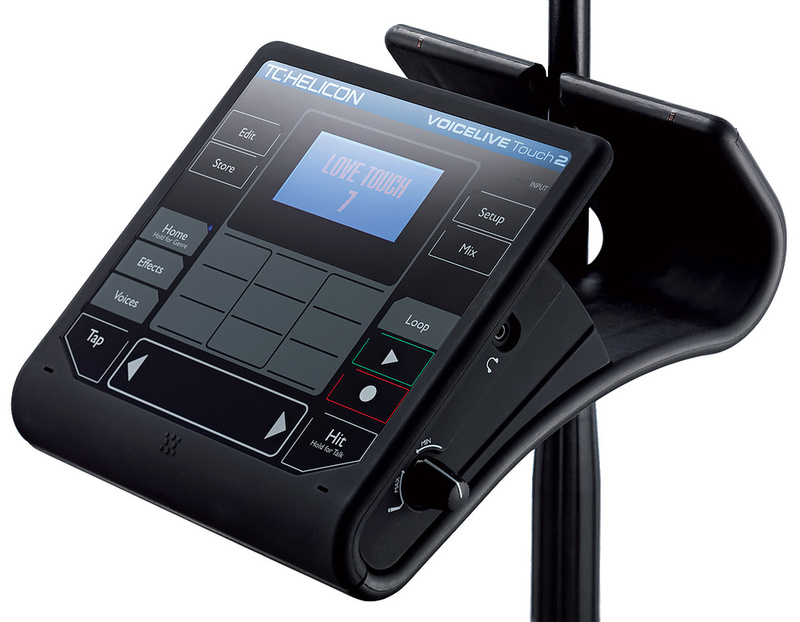 TC Helicon's VoiceLive Touch 2 is the company's latest live vocal processor, and it does just about everything you'd expect such a processor to do, including effects, three-part harmonies and pitch correction. It also offers looping and a number of more off-the-wall features that give vocalists 'DJ-style' control over their performance. All this is packaged into a reassuringly heavy but compact unit. You can determine which harmony lines the VoiceLive Touch 2 adds in a number of ways. One is to simply enter a musical key and let the process run automatically, although the harmonies sound better if they can follow chords. Second, a MIDI In socket allows for the inputting of note data to control harmonies in real time. Finally, a guitar input with a thru connector allows the harmony pitch to be taken from guitar chords, which works particularly well. The unit also has built-in microphones, which pick up sound on stage and can work out the correct harmony intervals based on what surrounding instruments are playing. The VoiceLive Touch 2 is built into a curved, rubber-coated metal plate, which has slots allowing it to be hooked securely onto the vertical pole of a conventional mic stand, keeping it in easy reach during performance. The top panel features a touch surface with nine large button areas, a 'Slider FX' control strip, and a clear, back-lit screen showing all the relevant information. Those touch buttons enable effects to be brought in or out during performance, while the slider can be assigned to various effect functions, from activating delays and sweeping filters to creating stutter effects. A button marked Hit allows different effect combinations to be toggled during a song (between verses and choruses, for example). Holding this button down gets you into Talk mode, so that you can mute the effects or tune a connected guitar in silence. Deep effects editing is available, for when you have the time to experiment, but when you're on stage, you can rest assured that everything is presented as simply as possible, with the touch panel giving fast access to the performance functions. A tap-tempo button provides a quick way to match delay and tempo-critical effects timing to live beats, and metronome and guitar-tuner functions are also present. All the main connections are on the rear panel. These could be a bit awkward to access once the unit is fitted to the mic stand, though, so cables are probably best taken care of before mounting it. Power comes from the obligatory external PSU (the only part of the product that doesn't feel fully professional), and there's a stereo mini-jack socket on the right-hand side of the case for connecting headphones. A stereo mini-jack input is provided for feeding in backing tracks. A standard XLR is used for the mic input, and there's a mono XLR line out, plus a pair of TRS jacks that allow for stereo operation. Jacks are also used for the guitar in and thru connections, but any guitar pedals used should be connected after the VoiceLive Touch 2, otherwise they could interfere with the unit's ability to track pitch. If a guitar is plugged in but the thru connector is not used, the guitar signal is mixed in with the voice signal, with a little reverb and chorus applied by default (though this can be changed in the settings). That leaves a jack socket for an optional footswitch, a MIDI input connector for MIDI keyboards or other controllers, and a USB cable for hooking up to a computer, for transferring software updates, managing presets and carrying MIDI data. The USB port also allows for audio streaming, so you can play backing tracks from, or record performances to, a computer. Because the VoiceLive Touch 2 is also your mic preamp, there's a level control on the right-hand side of the case to set the preamp gain. This needs to be adjusted during singing so that the middle of three LEDs forming the level meter comes on. The rear panel houses the Touch 2's audio inputs and outputs, as well as a MIDI In for harmony scale detection, and a USB port that allows for MIDI and audio streaming to and from a computer. In addition to the nine touch buttons, which change function according to what is on the screen, there are dedicated buttons marked Edit, Store, Setup, Mix, Home, Effects, Voices and Loop, plus record and play buttons for when the looper is active. Holding down Home shows the 200 available presets. Huge preset libraries can be both a blessing and a curse, as it can take forever to find one that suits the song you're working, on or that is close enough to be easily editable. Fortunately, the preset browser allows you to search by genre, so irrelevant presets are hidden. TC also plan to make additional artist presets available each month that can be downloaded free of charge. Once you've loaded a preset, tapping the Effects or Voices button lets you edit that preset's effect and harmony parameters. The Tap button, to the right of the ribbon controller, is used for inputting song tempo in real time. Pressing Edit displays the preset-editing screens, where small arrow buttons at the end of the ribbon switch between edit pages, and the slider changes the selected value. Tapping Edit again gives access to a more advanced level of editing, but there's nothing too scary here. Store is used for the storing or renaming of presets, while pressing Effects displays any effects being used, and lets you assign on/off switching to the nine touch buttons. Voices shows the harmony voice intervals, and, in a similar way to effects, each voice may be turned on or off using the assignable buttons. Tapping Loop brings up all the main loop settings on the keys (other than Play and Record, which have their own buttons), and these include erase, clear, reverse, and double-speed playback. The Setup key takes care of all the pre-show housekeeping stuff, such as selecting mono or stereo out, activating phantom power on the mic input, setting the receiving MIDI channel, and so on, while Mix accesses the global audio level settings. In general, the operating system is very clear and easy to use, with the quick-start guide telling you most of what you need to know. TC's established adaptive EQ, compression, de-essing and gating is present, of course, and this takes good care of optimising your voice's tonality (though with some voices, this can push up the high frequencies sufficiently to aggravate feedback, so a little counter-EQ on the desk may be needed). The general effect quality is impressive, particularly the reverbs, delays and modulations, and even the distortion effects sound right on those songs that demand them. Some tempo-sync'ed chopping and stutter effects are also available, which offer extreme tremolo-type sounds. How realistic the harmonies sound depends very much on the type of voice being processed. Singers with a clean, reasonably pure vocal tone are treated more kindly than those with a lot of vocal 'character'. Low and growly voices produce the least musical outcome, but even they can benefit as long as you pick the harmony voices with care and don't specify low harmonies for a voice that's already scraping along the bottom. When you need tuning powers, you can globally determine the strength of any pitch correction, from subtle to extreme. A separate, pop-oriented hard-tune special effect is also available, and this can be switched in on a per-preset basis. The looper here is actually something a bit special — not only because it is stereo, but also because it can layer up to six tracks, with loop-specific effects. These effects include Reverse, Filter, Slow Speed and so forth. If you've ever tried using a looper, you'll know that one of the challenges is getting the loop end points in exactly the right place, and in the VoiceLive Touch 2, TC have incorporated a feature called Loop Assist, to help you keep everything in sync using a metronome and automatic quantization of loop start and end points. Alhough this unit can do a lot of clever stuff, TC must be commended for keeping the operating system as simple as possible. It's really only the Looper that requires a bit of thought, because of the creative options it offers. I particularly like how effects can be assigned to the slider and then used to treat the loop as it plays back, to create filtering treatments and the like, while the unprocessed 'live' voice sings over the top. The rhythmic chopping effects are certainly fun, while the click track has a very useful kick-drum setting, which makes a good back-beat for acappella performances. The ability to work out convincing harmonies in real time from guitar chords is particularly impressive. Overall, then, the VoiceLive Touch 2 seems to be very well thought out, whether you simply want to add appropriate effects and the odd harmony to live performances or are a creative solo artist building multi-layer tracks in real time, complete with rhythmic vocal sounds and stutter effects. The unit is solid enough to stand up to stage use and is very performer-friendly, so it should have broad appeal. To date, the most advanced voice processors that also include harmony generation come from either TC Electronic or Digitech — although the physical format of the VoiceLive Touch 2 seems particularly well suited to on-stage use. The realism of the harmony voices depends to some extent on the tonal characteristics of the voice being processed. Lightweight external power supply doesn't match the solid construction of the unit itself. TC have distilled their existing voice-processing technology, combined it with some DJ-style processing and given it a practical physical format for live performance. TC Electronic +44 (0)800 917 8926. TC Electronic +1 519 745 1158.